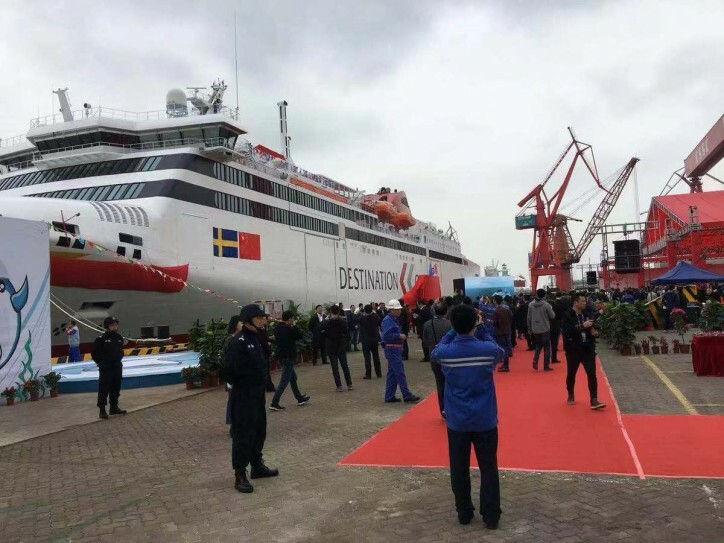 A new and luxury ro-ro passenger vessel built by Guangzhou Shipyard International Company Ltd for Swedish company Rederi AB Gotland was named VISBORG in a naming ceremony in Guangdong provincial capital on Saturday. "We Rederi AB Gotland are very proud of the 'VISBORG' which is among the most sophisticated RoPax with LNG ual-fuel propulsion in the world and which is a further confirmation of the high quality and innovation of Chinese shipbuilding," said Ann-Marie Ami Astrom, chairwoman of Gotland. "We hope to be able to order many more ships at GSI and China State Shipbuilding Company," she said. Chen Zhongqian, chairman of GSI, said the vessel is a landmark product for GSI's revitalization after the company moved to Longxue island, located at the mouth of the Pearl River, from the city's Liwan district in July last year. Construction of the vessel has cost more than 1 billion yuan ($149 million), a record high in building a single ocean and engineering ship in GSI's history, Chen said. "The successful construction of this vessel has laid a good foundation for GSI to proceed in the luxury Ropax market as our highly-quality development direction. And to date GSI has in hand the largest Ropax orders in China," Chen added. The high standard and environment friendly Ropax vessel is driven by dual-fuel engines and its navigational speed can reach 28.5 knots to become one of the fastest ro-ro passenger vessels in the world. At 200 meters long and 25.2 meters wide, the vessel is designed to have a capacity of 1,730 passengers. The vessel will operate between Wisky island and Oskarshamn Port. It also comes with entertainment facilities.